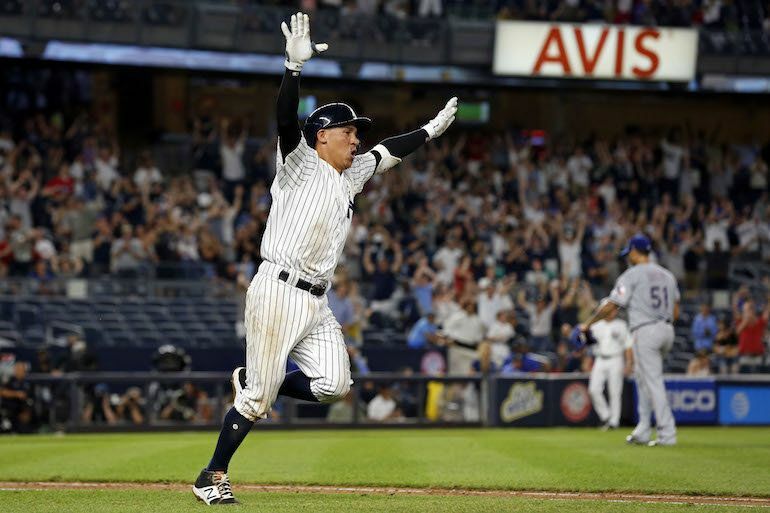 It's a bird, it's a plane...no, it's Ronald Torreyes! 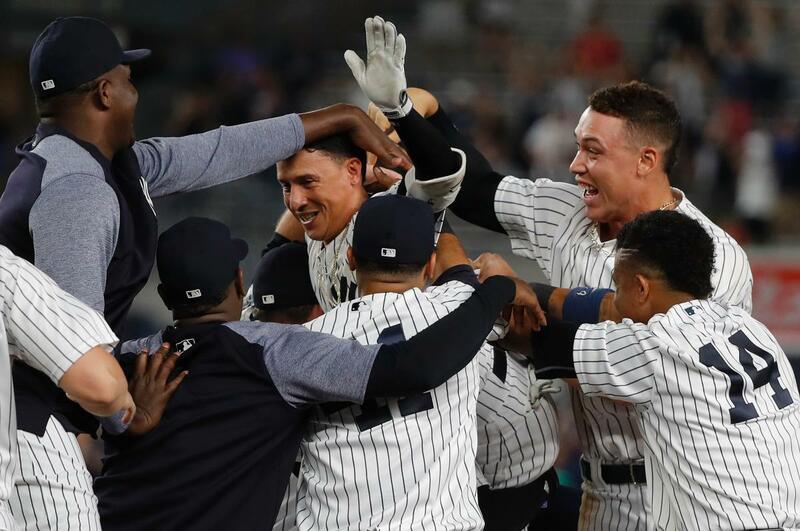 The unlikely hero delivered in the 10th inning with a walk-off run-scoring single as the Yankees took the first game of a three game set from the Texas Rangers. The game, delayed for an hour and forty minutes by rain, was a classic pitcher's duel between Japanese greats Yu Darvish and Masahiro Tanaka. The duel may have ended with goose eggs and no decisions for both pitchers, but they were incredible as the game did not see its first runs until the 9th inning. Worried about Tanaka prior to the game, he showed that he was anything but a concern as he pitched 8 innings of three-hit scoreless ball, Walking just two, he fanned nine. Darvish went 7 innings with no runs and two hits, and did one better than Tanaka with strikeouts (10). 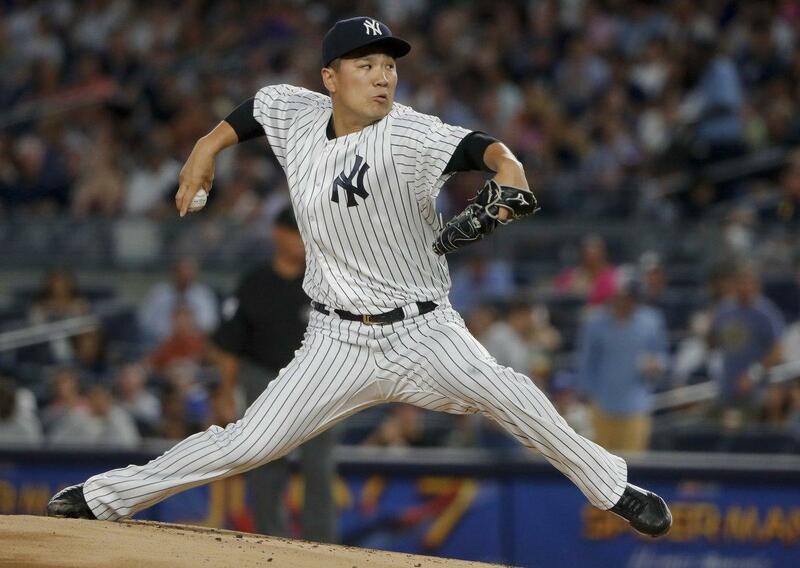 I am not sure what we'll see the next time Tanaka takes the mound but with Darvish as his motivation on Friday night, he was magnificent. 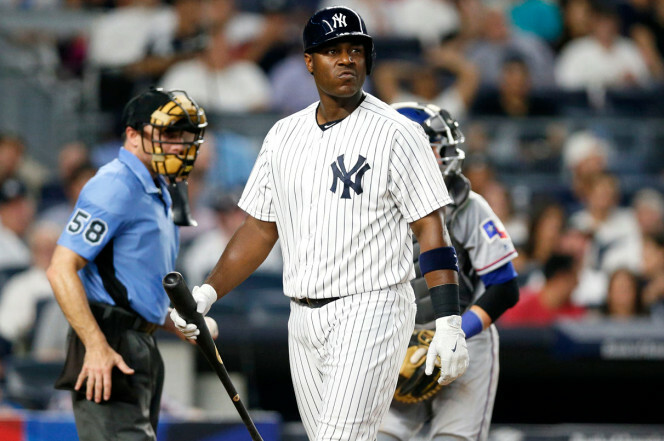 The Yankees brought Aroldis Chapman in for the 9th inning of the scoreless game. He struck out the first batter, Shin-Soo Choo, but Elvis Andrus followed with a single. Struggling with his command, Chapman, who was sweating profusely, hit Nomar Mazara with a pitch in the shoulder. With Adrian Beltre at the plate, Andrus stole third. A great defensive play by third baseman Torreyes in stopping a wide throw from Gary Sanchez prevented more damage at that point. But when Beltre struck out, the ball got away from Sanchez and Andrus ran home for the game's first run. Carter had a chance to be a hero in the bottom of the 8th with Gary Sanchez on first and two outs. But he feebly struck out swinging. There was something about that weak final swing that gave me an "I'm done" feeling. It was reinforced in the 10th when Carter struck out with a huge opportunity to be the game's hero. Apparently, GM Brian Cashman felt the same way as Carter was designated for assignment immediately after the game. Tyler Austin, who has homered in his last three of his last four games, was recalled to take Carter's place. In the 27 games at Triple A after his reactivation from the DL in late May, Austin has hit .300/.366/.500 with 4 HR's and 21 RBI's for the RailRiders. Of his 30 hits in 100 at-bats, 17 have gone for extra-bases. The alarming statistic is 32 strikeouts but Austin has really been heating up with the bat over the past week. He has played error-free baseball at first. Welcome back, Tyler! Trust us, we are very glad to see you. 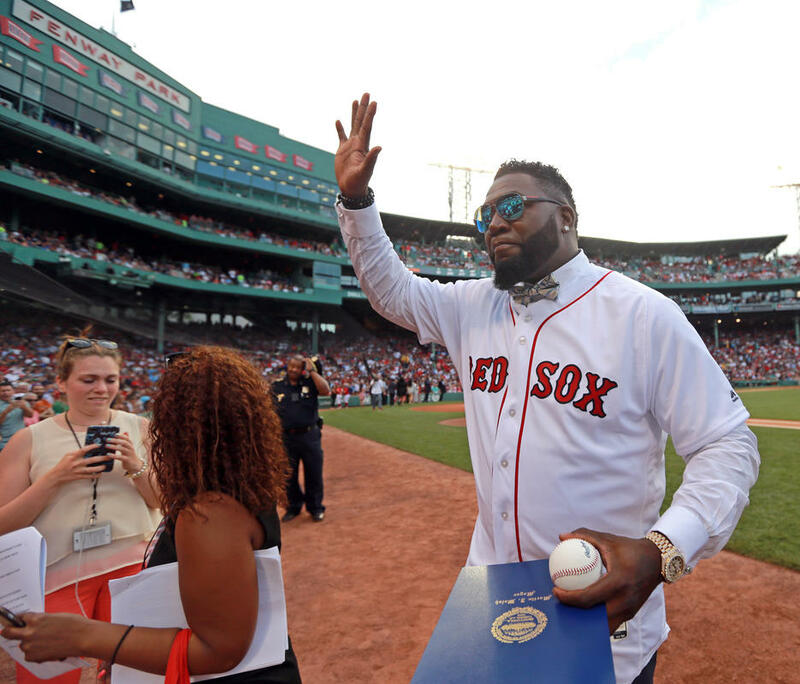 The Boston Red Sox retired the number of David "Big Papi" Ortiz last night in their game against the Los Angeles Angels at Fenway Park. Big Papi was a thorn in the Yankees' side for many years. Time and again, a game was ended with a Big Papi blast. I am very glad that #34 will no longer be an active number worn when the Red Sox come to town. My biggest fear was that he would "un-retire". Red Sox center fielder Jackie Bradley Jr expressed it well when he said, "That just lets you know what a special impact he's made in the community and the organization and all of baseball. What he's done for the city, the team, people around him, it's well deserved. I know we couldn't be any happier for him." I agree. As a Minnesota Vikings fan, I couldn't wait for the Chicago Bears' Walter Payton (may he rest in peace) to retire, and I felt the same about Papi. More than anything, it is a sign of how much respect I held for those men. A close friend of mine who is a lifelong, die-hard Red Sox fan, and Boston-area resident, did post this comment on Social Media: "This is just my humble opinion, but I think it is much too early for the Red Sox to be retiring Ortiz's number. With the exception of Johnny Pesky, the honor of having a number retired by the Red Sox was reserved for those players who entered the Baseball HOF." My response...whatever it takes to keep him from coming out of retirement. The Boston Red Sox are going hog wild in an attempt to find help. Yesterday, they signed pitcher Doug Fister, released by the Los Angeles Angels, and shortstop/third baseman Jhonny Peralta, who was cut by the St Louis Cardinals. Injuries to their pitching staff forced the Fister move. The disaster known as Pablo Sandoval brought in Peralta. I still think the Red Sox will be heavy players for Kansas City's Mike Moustakas at the trading deadline. The Boston Globe is reporting that the Sox should have about $9 million to play with before they risk crossing the luxury tax threshold. Happy Saturday! Let's Go Yankees!